The better half of Next Gen House is now a triathlete. You know I'm not talking about me. 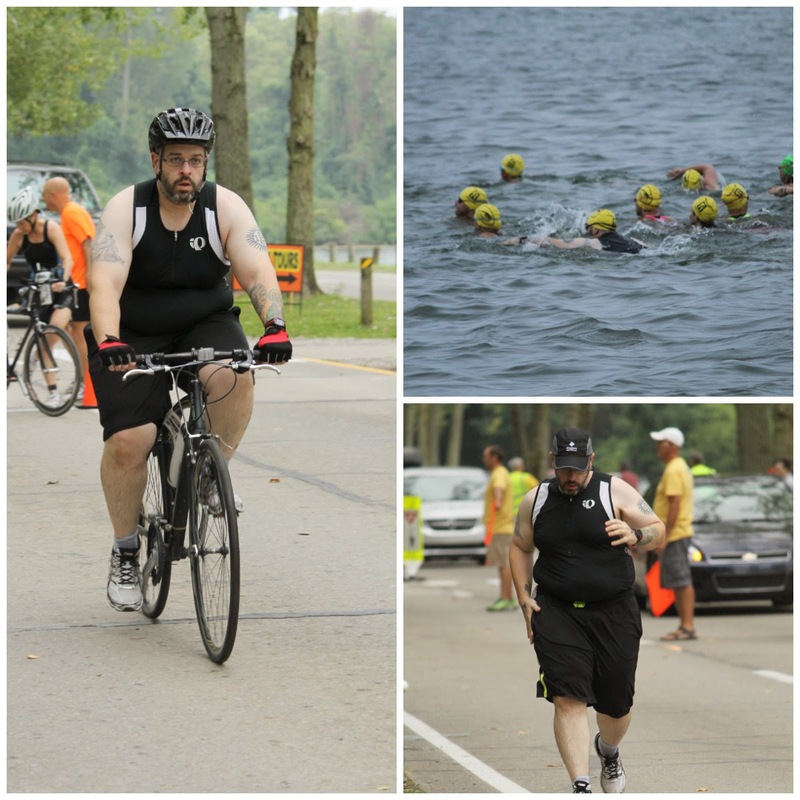 Saturday morning, earlier than the crack of dawn, we headed up to Erie for Mark to participate in his first triathlon - the Presque Isle Triathlon at Presque Isle State Park. It's a sprint tri - you swim 0.35 miles, bike 13 miles and run 3.5 miles. This particular tri draws everyone from elite Ironman competitors to first time triathletes, and from what we gathered it was very well organized and ran like a well-oiled machine. You know who else was a well-oiled machine? This guy. He did awesome, and beat the time he was aiming for by more than 15 minutes. That's just crazy. I enjoyed cheering so much, particularly because I'm usually competing in most of the events I've ever gone to like this. So it was great to look people in the eye, especially during the run portion where they weren't going by in a blur and were tired, and cheer and clap and encourage. I spotted this sign, the best one of the day. I bet it made whoever John is smile. The weather held out and it wasn't more than two hours after the tri was over that the sun came out and started baking everyone, so thankfully he didn't have to do this in full sun. The conditions were ideal, except for maybe a stronger current than anticipated in the bay where they were swimming. All in all, it was a great event to spectate at and so fun to watch people give it their all. I was so proud of Mark, my heart almost burst out of my chest. I know how it feels to be dedicated to a training regimen and to be in the dog days of it toward the end where you're not sure the event will ever come and you're just plain tired. He stuck with it through the humidity this summer, in the rain and the heat and just completely knocked it out of the park this weekend.